Commander Wright Air Development Center Attn. WCRRE Dr. Max G. Sherberg Wright - Patterson Air Force Base Dayton, Ohio. 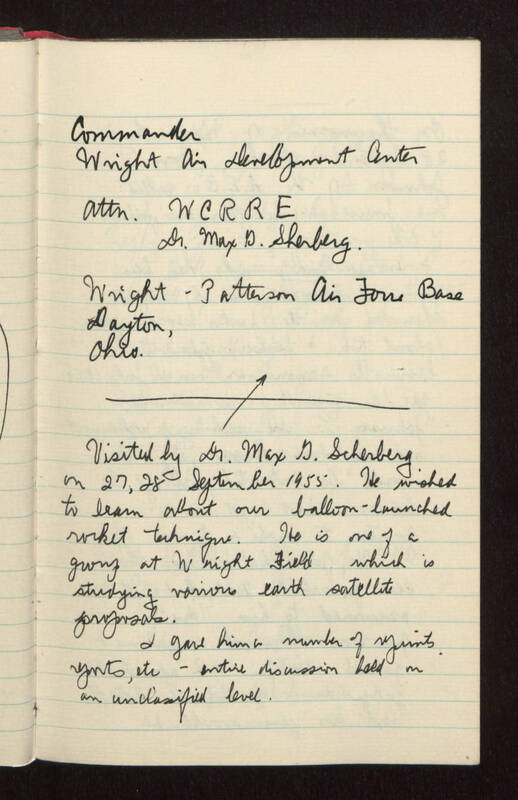 Visited by Dr. Max G. Sherberg on 27 & 28 September 1955. He wished to learn about our balloon - launched rocket technique. He is one of a group at Wright Field which is studying various earth satellite proposals. I gave him a number of reprints, reports, etc. - entire discussion held on an unclassified level.